on rope to decorate their porches. We made another long haul yesterday, from Cedar Keys to Anclote Key, which is just off the coast from Tarpon Springs. We were out of sight of land--except for the tall stacks of a nuclear plant, which made a useful navigational landmark. About the only other thing we saw all day were dolphins and crab-pot floats. Other Loopers warned us: "In this stretch of water, watch out for crab pots!" To answer a question received off-blog, here's a short treatise on "everything you always wanted to know about crab pot floats" . . . and why they strike fear in the hearts of boaters. If you are wondering, "Where in the world is Carmen San Diego?" . . . 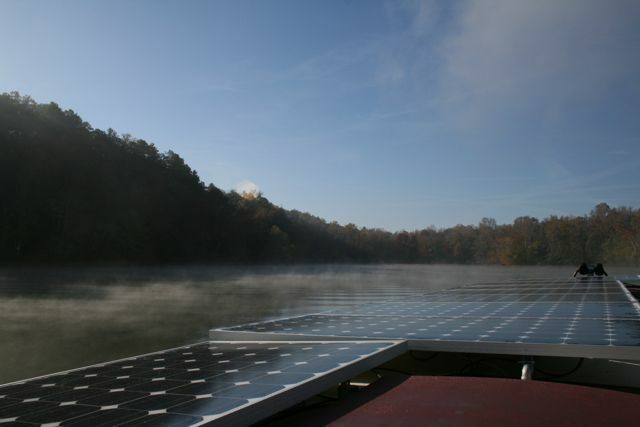 I mean, SlowBoat, well, we left Steinhatchee before dawn Tuesday morning: air temperature 19 degrees, boat decks and solar panels liberally coated with ice. After 10 hours of hard driving under a clear but cold sky we finally dropped anchor last night outside of Cedar Keys, Florida (population 790). First the "Grand Canyon of Florida,"
and now here we are at the "Niagara Falls of Florida"
As you'll recall, last week we made the most challenging traverse of the trip--82 miles across open water, far out of sight of land, from Carabelle to Steinhatchee. But the fun wasn't over. From Steinhatchee, we needed to make two more hops, more than 60 miles each, before we reached Tarpon Springs and rejoined the Gulf Intracoastal Waterway (and protected waters) at Tarpon Springs. The trip from Steinhatchee to Cedar Key was the first hop. It had been great to take a break in Steinhatchee--to have a stable floor beneath our feet, take a bath, have reliable cell phone and internet, to sit indoors and be warm without wearing layers of clothes or fussing with fiddly flame-based heaters. 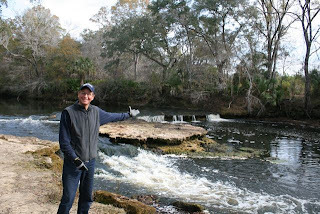 On Sunday, to stretch our legs, we packed a lunch and went birding at Steinhatchee Falls, one of only two waterfalls in Florida. (Click here to see video of these tiny falls actually falling). I am not a pig. I am a "Hoover Hog"
Maybe you've heard this joke. Guy drives by a farm and sees a three-legged pig, wearing a wooden leg. Guy asks the farmer, "What's up with that pig?" Farmer says, "Last year, the house caught fire. We passed out in the smoke. Pig used his mouth to turn the doorknob. Dialed 9-1-1 with his snout. Then ran upstairs and dragged us out of our beds and out of the house." "That's remarkable," says the man. "And the pig got injured in the fire?" "Nope," says the farmer. "A pig that smart, you don't eat him all at once." I thought of this joke Friday, when we bought some locally caught stone crab claws at the Steinhatchee Fish Market. 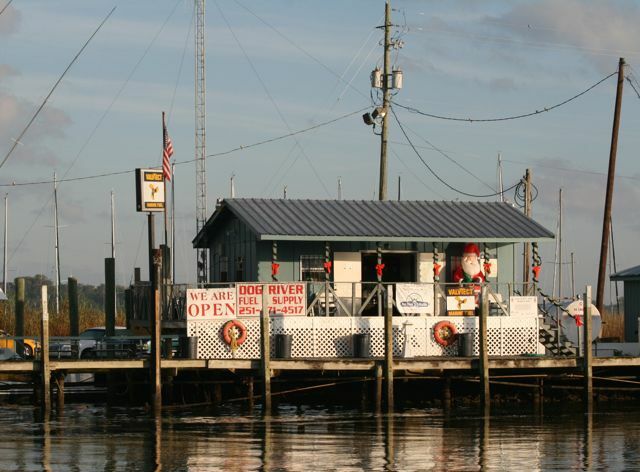 Santa sells seafood by the seashore. Say it six times fast! In a small town like Steinhatchee, nuthin's open on Christmas Day. I mean, nuthin'. So we went foraging for provisions the day before, to tide us over. 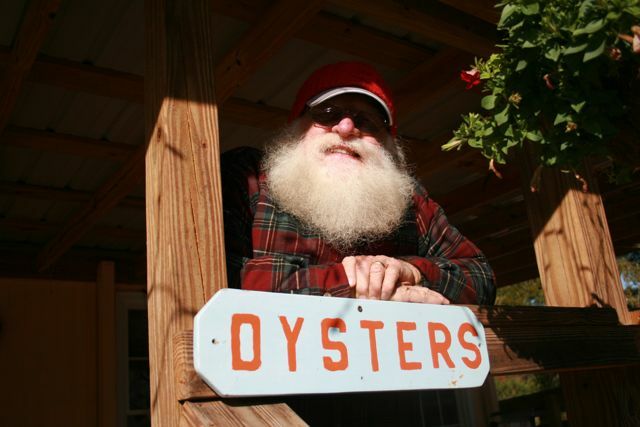 Imagine our surprise to find THIS guy selling seafood at the Steinhatchie Fish House! We had rented a car--which is to say we gratefully paid $20 bucks to borrow the aging Ford Explorer usually reserved for the resort housekeeper to make her rounds in-- so we could do a spot of sightseeing. First stop: The Road to Nowhere. We're holed up in the tiny fishing town of Steinhatchee, Florida (population 738), waiting out the weather. Our intrepid little canal boat has more than proved she can take on big water . . . but though we're crazy, we're not stupid! When the forecast is for wind more than 15 knots or "Waves 2 to 4 feet" or more (10 feet this weekend!) we stay in port. A boater we talked to the other day said, "I spent a week in Steinhatchee once. Longest year of my life." But we like small towns, where the guy who nods "hello" in a store will later stop when he sees you walking by the side of the road and offer you a ride, and where the local diner is decorated with so many lights, you'd swear you are INSIDE a Christmas tree. 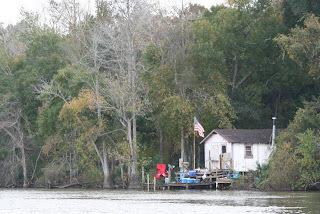 We're docked on the Steinhatchee River, waiting for better weather before we continue our travels south. 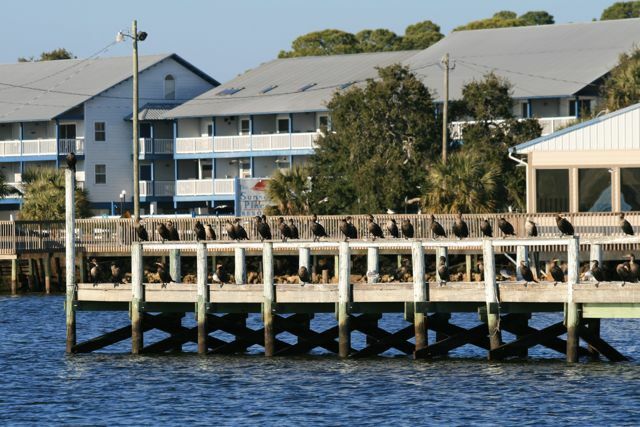 If you want to see the view--as we see it--check out the Steinhatchee River WebCam! I am strong, I am invincible, I am ready to pilot my boat for 15 hours non-stop across the Gulf of Mexico! We've spent the last few weeks plotting and planning how to cross Florida's "Big Bend"--the U-bend where the Panhandle meets Florida's West Coast. The Gulf IntraCoastal Waterway doesn't go around the bend; to get to the West Coast you HAVE to cross open water. For a boat as slow as ours, it's quite a puzzle how to make the crossing. You have to factor in the hours of daylight available, the timing of the tides, predicted wave height and wind direction, and which harbors a creeping SlowBoat can reach before the weather changes. The Cap'n spent hours checking charts and seeking local knowledge. Finally, a plan: Early Tuesday we would leave Carabelle, Florida, and cross to Steinhatchie, a fishing town. Total distance about 75 miles. How Many Days Till She Runs Off the Boat, Screaming? 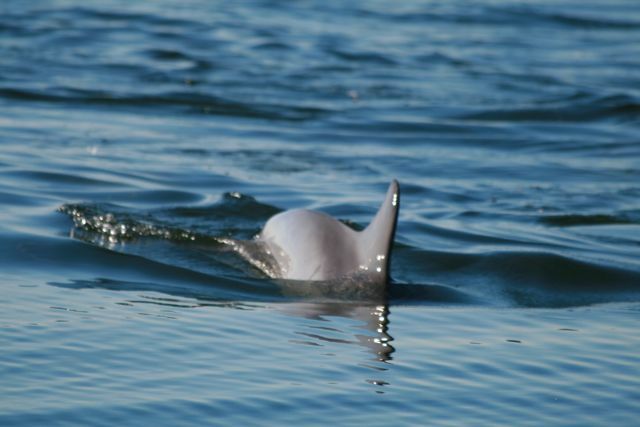 If you're wondering why the blog has been quiet the past few days, we've been holed up in Apalachicola monitoring events at home, where two of our nearest and dearest have had some health challenges. It's hard to write hearty travelogues when you're worried sick. Dear friends have cared lovingly for our son, and Dad is surrounded by family and doing better. In the middle of all the worrying we nearly forgot that we were celebrating an anniversary: 27 years of wedded bliss. Twenty-seven years. Plenty of psychologists have interviewed passels of old married fuddy-duddies, trying to worm out the secret answer to the question, "How do people manage to stay married?" Indeed, when we told folks we were planning this trip, it was remarkable how many woman (how VERY many women) said to me, "I could NEVER be on a boat with just my husband for that long." 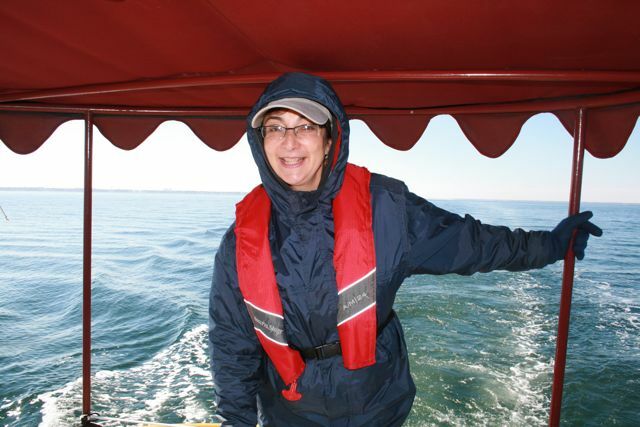 At the beginning of our trip, a friend was taking bets: "How many days on the boat till Cynthia runs ashore, screaming?" Amazingly, no one has collected yet. "I didn't eat all of these oysters--but I could have!" One goal, on this boat trip, has been "eating locally." 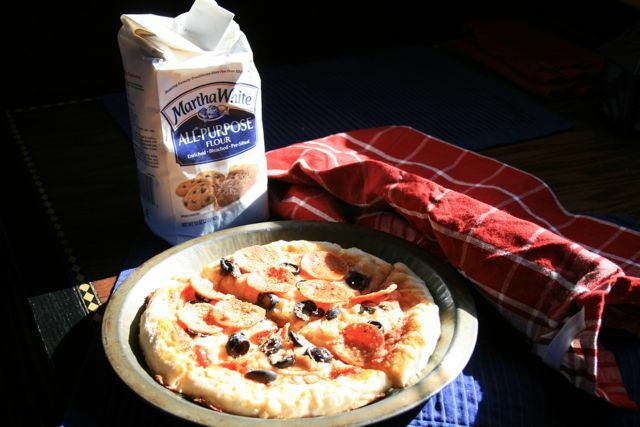 We visit farmer's markets, and we eat at restaurants that feature local ingredients, and we pore over grocery-store shelves to find local products such as meats, cheeses, honey, and flour. 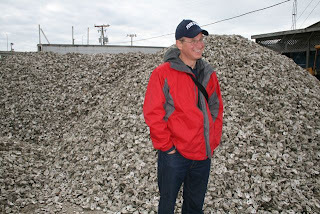 Right now we're in Apalachicola, Florida, where the most famous locally produced food item is oysters. 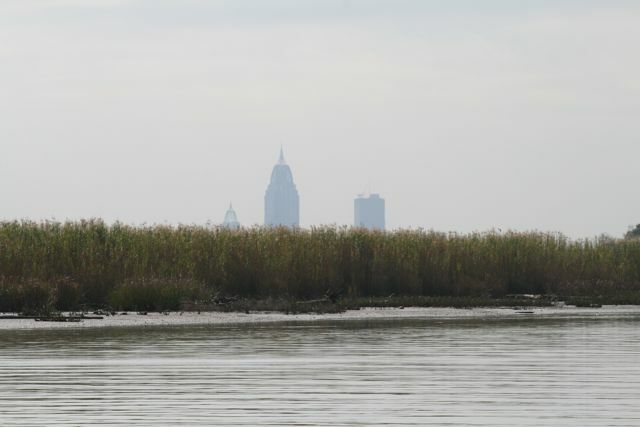 One in ten oysters eaten in American restaurants comes from this little patch of protected waters. 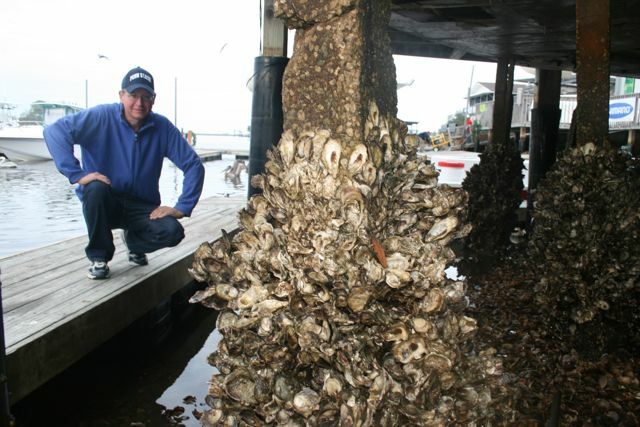 Ten percent of the residents are oyster fishermen. Some streets are paved with oyster shells. The local radio station is "Oyster Radio." Of course you are wondering, has this area been affected by oil from the Deep Horizon spill? We've been working our way along the underside of the Florida panhandle, following the network of canals, bays, and sounds that make up the Gulf Intracoastal Waterway. The scenery says "Florida": Palm trees and beaches with sand like white sugar and dolphins leaping from sparkling blue water. The air temperature says "Upstate New York." Just our luck to visit during a record cold snap. 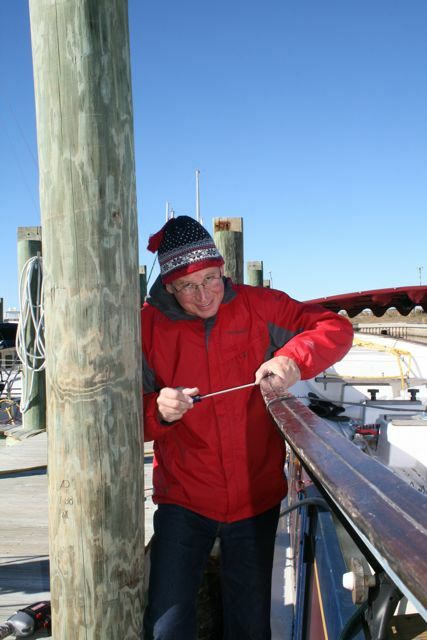 Sunday night, we tied gratefully at the dock at Port St. Joe and on Monday, while the crew shopped for thermal underwear at the town's lone clothing store, the Cap'n visited three hardware stores, two dollar stores, three furniture stores and an auto parts store, looking for construction supplies to winterize the boat. Because of this trip, I'm now paying rapt attention to news stories I might have skimmed in the past. Like the story today, in the New York Times: "U.S. Vulnerable to Rare Earth Shortages." China is the world's leading producer of rare earth minerals, and the nation is moving to limit exports. Because our electric motor--the one that lets Dragonfly run with the sun--uses several kinds of rare earth. 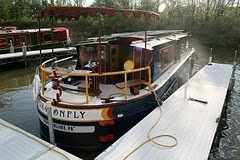 Back in Mobile, Alabama, the crew of the Dragonfly were mistaken for homeless people. At the time, we contemplated our oil-stained sweatshirts, our frayed, wrinkled shorts, and our broken-down belts (the ones with the extra holes inexpertly punched using a hammer and nail) and said, "So what?" But lately, the weather forecast has included "gale force winds." Overnight temperatures have been so cold, the marina turned off the water supply lines on the docks for fear of a damaging freeze-up. When the going gets tough, the tough go shopping. We're in a small town, so the clothing store options are limited. But Port St. Joe does have an "outdoor outfitters" store . . . a retail category which sometimes means, "Your options in Gore-tex-coated polar fleece are limitless," and sometimes means, "Get your bikinis and novelty T-shirts here." I remember vividly the fourth day of our trip. The chart showed that our route along the Erie Canal would temporarily take us away from the narrow, secure channel . . . out into the waters of Cross Lake. Our first "open water" crossing! Was I nervous? Yes I was. Of course Cross Lake is a tiny little pond. In retrospect, my terror seems ridiculous. But at the time, I assure you, it was genuine. As the Erie Canal opened into Cross Lake (which is a good half mile across, but seemed bigger), I scanned anxiously with binoculars across the army-green water. 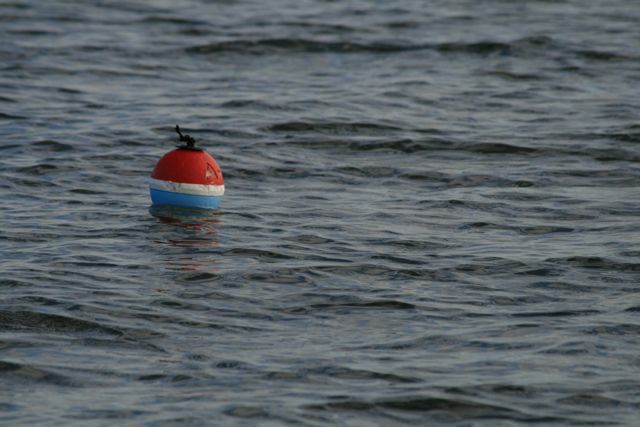 And there they were, right where they were supposed to be--buoys marking the way! 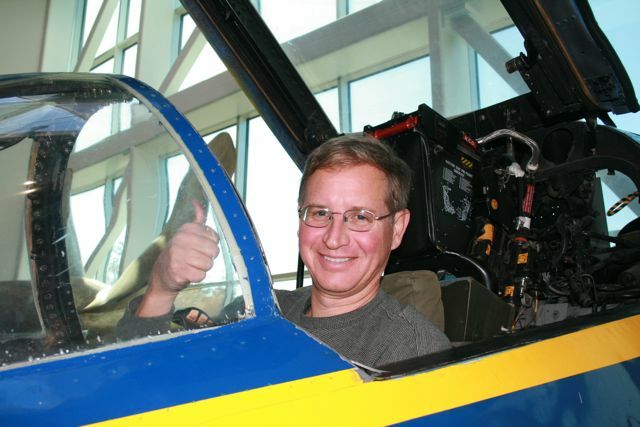 Cap'n gives the thumbs up to this "Blue Angel" jet. Goes a trifle faster than our boat. The last post left Dragonfly scurrying through the cold and the winds to Pensacola, Florida . . . where we found a grateful haven at Palafox Pier, a downtown marina. Next day Ron loaned us his truck for a visit to the National Naval Aviation Museum, which has sufficient awesomely cool planes to make the average 8-year-old boy pass out with pleasure. And behind those dunes . . . the open ocean! Picture this: You're skiiing in Vermont, knees bending rhythmically as you bounce up and down, over the moguls. It's a sunny day, but the cold finds its way into the little gaps at your wrists and neck. The wind rushes past your face, making your eyes water. Inside your fleece gloves, your fingers are starting to sting, and your toes are numb inside your boots. Now image this: While you are skiiing, you lower virtual-reality goggles in front of your eyes. 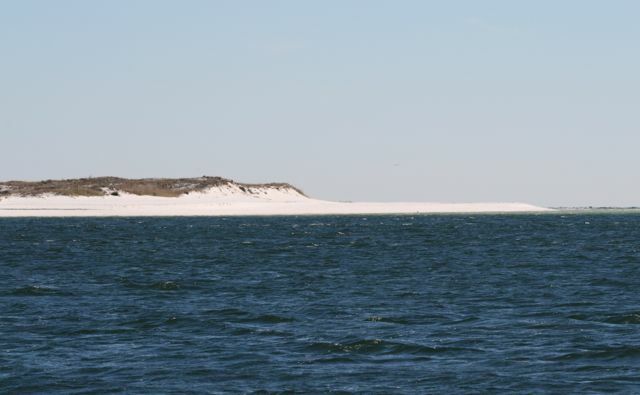 It's still cold and windy, but instead of white snow and ice-covered spruce trees, you see a white sand beach, backed by low dunes and fronted by ultramarine water. You see umbrellas in bright primary colors shading lounge chairs, rustic wooden piers where pelicans stretch and preen, a fringe of palm trees. That's what it was like to cruise the Gulf Intracoastal Waterway yesterday. When the bar band strikes up the Jimmy Buffet anthem "Margaritaville," do you know all the words and sing along? Another Saturday night, and SlowBoat was docked literally steps from the actual Margaritaville: Lulu's. 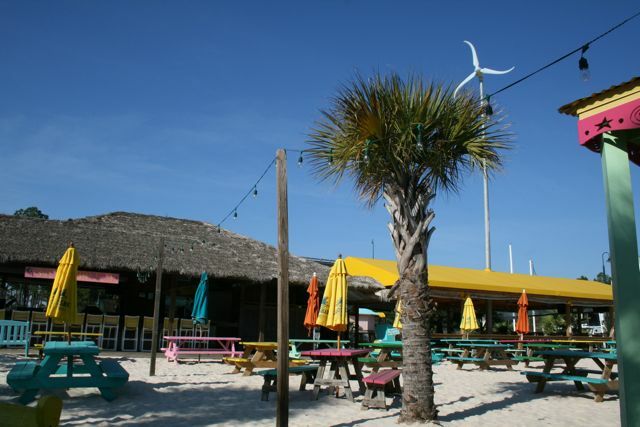 This funky restaurant is owned and operated by Jimmy Buffet's sister, Lucy. We're told that 10 years ago this place was a dive; these days it's an engineered tropical paradise, serving cheeseburgers to as many as 4,000 guests a day in summer. I wandered around Sunday morning, checking out the palm trees, the candy-colored lawn chairs, the thatched-roof tiki bar, the pretend-beach with its gleaming white sand . . . and the wind turbine. Huh? Dog River Marina on Mobile Bay. Ho Ho Ho, transient slips for rent! You know how it is: Thanksgiving rolls around, and next thing you know, Christmas decorations are everywhere. We left Dragonfly tucked up in a side channel on the west of Mobile Bay last week while we flew home to snowy Upstate New York, to spend Thanksgiving with the Cap'n's family. How amazing to travel 600 mph in a plane. And . 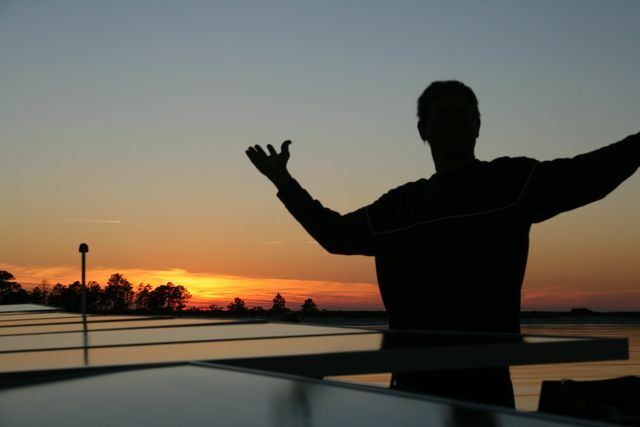 . . how quickly we burned through the "carbon footprint" savings we'd accumulated over the past 6 months by running with the sun. After a wonderful week with family and friends, we are now back on the boat. 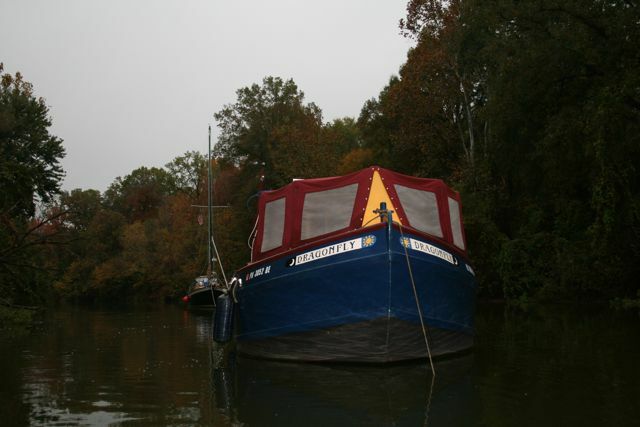 And as of today, our SlowBoat is half-way through her grand adventure. She has travelled 3,000 miles in 6 months, with 3,000 more miles to go in the next six months. 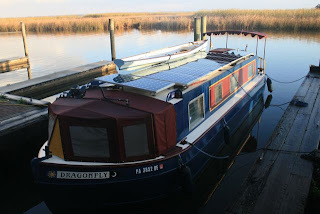 Right now, the Dragonfly is docked under the sun on the slightly salty waters of Mobile Bay. Today she got this postcard from her brothers and sisters, back home on the Erie Canal. Great to hear from you, guys! The Dragonfly's crew is in State College today and tomorrow! In upstate NY the rest of the week. We'll be back on the boat Friday. In the mean time, we're catching up on blog posts. When we first announced we were making this trip, many of the crew's friends asked her, "Where do you keep your clothes?" This question being code for, "That boat is so small! You can't possibly pack much! How will you stand it, wearing the same clothes day after day?" Yup, ladies, fashion-wise, being on a boat is boring. It's not like the days when you went "yachting" dressed in white from head to toe; alas for the days of jaunty French sweaters in a nautical stripe and Jackie O sunglasses. We took what amounts to a backpacking wardrobe: A small selection of easy-care fabrics in dark colors. And full-body raingear. (Guest blog from Bill). When we bought her, we couldn’t lock Dragonfly’s stern doors from the outside. To secure the boat, we’d latch the stern doors from the inside, walk forward through the boat, and exit through the (lockable) galley doors into the canvas-enclosed bow. There, we would unzip the canvas, wiggle out, rezip, and go ashore. Not too inconvenient, at least when tied to a long dock wall in some cute little town on the Erie Canal, with the bow and the stern both accessible from the dock. Since we left the Erie Canal, it has usually been easier to exit and enter the boat at the stern. At marinas, we generally back the boat in between finger docks and position the stern against the main dock. This geometry makes it easier to socialize with other dockside boaters, and facilitates loading and unloading supplies and gear. But to enter the boat when it was locked up, we still had to come in through the bow at the other end of the boat, which, depending on where we were, might mean traversing a slippery exterior walkway in the dark, with the deck pitching up and down in the surf, pirate cannon-fire all around, sharks circling beneath—you get the picture. Anyway, with my rural background, the way that I proposed to deal with Dragonfly’s security shortcomings was to sometimes leave the stern door unlocked. “Honey,” I’d say to the First Mate, “we’re just going to the end of the pier. There’s no need to lock the boat.” After all, from the Apulia Station perspective, locking the boat is like publicly announcing, “I don’t trust you people in this marina/at this dock/in this town.” Why would you do that? Your neighbors are the people who look after your house when you’re away. Cynthia grew up in urban Springfield, Massachusetts. When she was a child, her neighborhood was still relatively charming and safe, but by the time the two of us met, the “neighbors” who would walk into a house in her hometown neighborhood without knocking were leaving with the valuables. So the fact that Cynthia has a different personal-comfort security threshold is understandable. “Honey,” she would say to me, “everything we need to survive for the next 12 months is on the boat. Can we please lock up?” From a Springfield perspective, leaving our doors unlocked was like offering free job-training for miscreants and felons. Figuring out how to lock the stern doors was challenging. Unlike a conventional house door, the two steel doors swing out and an abutting roof hatch (which clears your head as you descend the stairs) slides forward. So three different moving parts must be secured. And because we might still reboard from the bow, it was important that the exterior locking system not prevent egress. In a fire on a boat, you want as many exits as possible. In hindsight, the solution was pretty simple, even though it took weeks of head-scratching. We drilled a hole in one of the exterior steel tracks on which the roof hatch slides. To lock the boat from outside, we slide open the roof hatch, reach down into the boat, and secure the steel doors. We then slide the hatch closed and put a weatherproof padlock through the hatch-slide hole (see photo). If people are on the boat with the padlock in place, the roof hatch won't slide, but they can still open the steel doors and exit. So the arrangement is both secure and fire-safe. 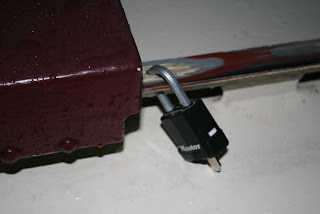 The only downside to the system is that when we leave the boat, we have to attach a padlock to the hatch slide. I usually try to shield this activity with my body so that our marina neighbors won’t think we don’t trust them. The First Mate and I stood there for a few seconds, trying to figure out how to respond. What a strange question. Does he want to hear the whole saga of how we secure the hatches? And just exactly why does he need to know? Would it be neighborly to tell him all about it? He’s obviously a trustworthy person; after all, he’s the night watchman. Can I NOT be thankful for spiders? SlowBoat is docked in Mobile Bay while her crew flies home for Thanksgiving. We wish you a very happy Turkey Day. Check the blog over the break for a guest essay from the Cap'n! We're thankful for . . . I DO have more photos that will wrap up our trip down the Tenn-Tom Waterway. But first, a digression. Jim F writes: "Hey Cynthia, you've described the Dragonfly pretty well to date but you've avoided the "potty" issue. Do you have a marble bathroom? . . . or a bucket?" The hundreds of soldiers stationed at Fort Gaines during the Civil War shared this 10-seat latrine. A channel to the sea provided the flushing action. Jim, thanks for taking the plunge to address this delicate issue. Hold your nose and here goes. The first thing I can tell you is that our boat bathrooms are NOT like the bathroom we visited yesterday (photo above) at Fort Gaines, on Dauphin Island, south of Mobile. 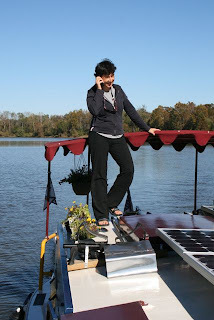 We anchored Thursday night on the Tensaw River, near some rough-hewn fish camps, and early Friday morning we set out on the last leg of our journey down the Tombigbee River. We were a mere 12 miles north of Mobile Bay and we marveled at the mostly unspoiled landscape: a bald eagle perched at the top of a cypress snag, a raft of pelicans foraging in a little cove bordered by palmettos. Then we spotted an incongruous sight: an elegant spire, rearing above the marsh grass. It was the top of a skyscraper. The city of Mobile was just ahead. What creatures lurk beneath the placid surface of this marsh? Years ago we took our children on a trip to Maine. As we drove north along the New Hampshire coast, the Cap'n turned to the kids in the back seat. "I predict we'll see a moose as soon as we cross the border," he said. "Oh, sure, Dad." Eyeballs rolled. A few minutes later, there was the shiny green and white road sign: "Welcome to Maine." And just past it, another sign, the yellow "warning" diamond with the black silhouette. "Moose crossing." More groaning and derision. "A picture of a moose doesn't count, Dad!" Right at that moment, a young moose shambled out of the woods by the state department of transportation storage barn and moseyed across the short grass at the verge of the road. That incident earned the Cap'n legendary status for his ability to commune with and predict the appearance of wildlife. And his prowess continues. Our little burst of riverine internet access was a false alarm . . . we immediately cruised out of whatever zone we were in and have been unplugged till today. And today, we are actually in Mobile, Alabama. But before I tell you about our trip through Mobile Bay, dodging ocean liners, I'll catch you up on where SlowBoat has been cruising since our last post, when we left Demopolis, Alabama. That was a week ago Sunday. We were in the Demopolis Lock with five big white trawlers, choking on diesel fumes, eavesdropping on the lockmaster as he chatted on the radio with the captain of the towboat waiting downstream to enter the lock. Lockmaster: "Got a flock of snow buzzards comin' out, captain." Tow captain: "I see 'em, I see 'em, looks like a little ol' herd o' turtles, comin' out of that lock." 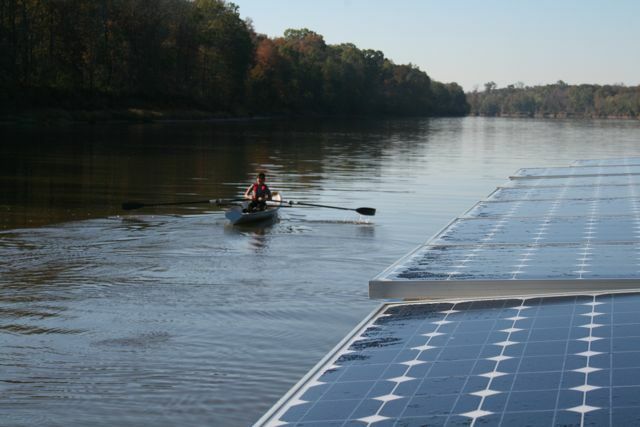 We've been running down the Tombigbee River toward Mobile, in the heart of rural Alabama . . . apparently an internet-free zone. That's why the blog has been silent the last few days. With a shaky, tentative connection, I'll try to start catching up. Photos to come! Last week, as we prepared to leave our snug harbor at the marina in Columbus for the run down a (mostly) wild stretch of river to Demopolis, a rumor was going round. "With so many 'Loopers' headed downstream," people said, "the river's gettin' mighty crowded!" "I hear the anchorages are completely full by nightfall," one person told us. "You could be left with nowhere to stay for the night." 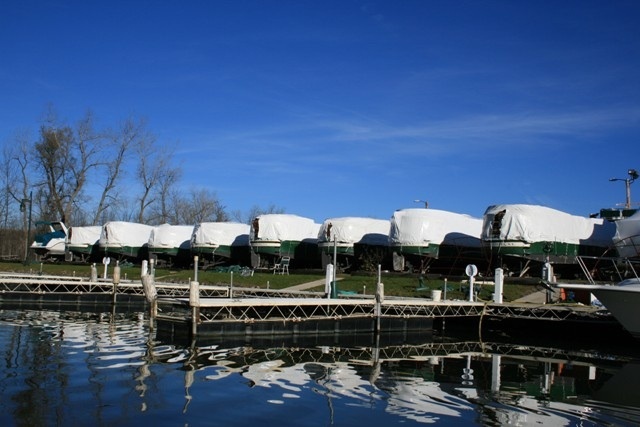 "The marina at Demopolis only lets boaters stay one night," said another, with a worried frown. "Going to be hard to re-supply and fix up your boat for the run down to Mobile." But once again, our funny little boat demonstrated the perverse power of going slow. This past week we found beautiful anchorages--side channels, pretty little coves decked with bald cypress and palmetto, completely deserted. I think what happens is that these other boats, which can easily go 50 to 90 miles in a day, consult the same guidebooks and tend stop in the same places. We, on the other hand, go a paltry 15 to 25 miles day (we can do 50 if pressed, but it's a grind!) So we are in effect forced to stop at the little-visited places . . . or find new anchorages on our own. Boat culture also dictates you carry your drink of choice to cocktail hour (many boaters have this down to a science, with stylish plastic or metal wineglasses and mini-coolers for re-supply) plus a snack to share. The conversation flowed as if we'd all know each other for years. We laughed and laughed. 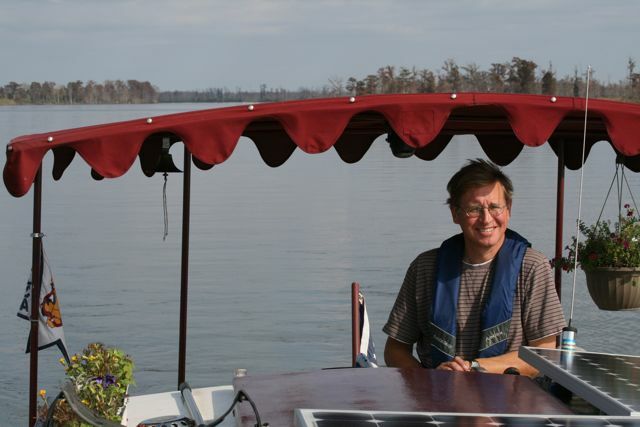 During our days in Demopolis we did boat chores--change the oil and the various filters, stock the cupboards with food and take on water, wash the boat. (A clean boat is a happy boat!) The Cap'n saw his first alligators--lifelike rubber beasts, eight feet long, in the parking lot outside the marina restaurant, where Sam Adams is a "premium import." We ate spicy, rich jambalaya and practically licked the plate. The tour guide painted a vivid picture of a multi-talented and energetic man (successful farmer and businessman, self-taught and able architect, musician, composer, artist) but made no mention of the slaves who worked for 18 years to build the place. Bluff Hall, another white-columned confection perched on a stretch of white chalk bluffs, is rumored to have been the inspiration for the plantation house called Lionnet in the play "Little Foxes," the best-known work of Demopolis native Lillian Hellman (whose great-grandfather Isaac Marx was the town's first Jewish settler). On our way to Bluff Hall we noticed a modest Jewish synagogue in a residential neighborhood. Our guide at the mansion (a striking black woman, elaborately dressed in a gold jacket, long black skirt and high-heeled boots) also made no mention of the slave labor that built or maintained the home. She told us the town's small Jewish population now travels to Tuscaloosa, an hour away, to worship, but the local Episcopalian church maintains the synagogue out of respect for the town's diverse heritage. This morning's Philadelphia Inquirer notes that when we ring in the year 2011, Americans will start to celebrate a whole lot of 150th anniversaries relating to key events during the Civil War. OK, at the Pennsylvania battlefield in Gettysburg it's called the Civil War, but here in Demopolis it's "The War Between the States," according to the brief town history published in a glossy pamphlet distributed by the Chamber of Commerce. Besides these indicators that we're in a different cultural region,we notice that we now stand out for our funny accents. When we order lunch at a restaurant, or pay for groceries, the pretty young girl in the apron looks at us quizzically and says, "Scuse me?" We're working on speaking slowly as well as traveling slowly. We left Demopolis yesterday morning under gray skies. The air was heavy with wet mist that didn't quite turn to rain. Five other big white boats left the marina at the same time, and as we approached the Demopolis lock, three miles downstream, each boat radioed the lockmaster in turn, so he would know how many boats were coming and could think about where to place us in the lock (it depends on the length of the boat). Monitoring the radio we overheard this conversation. Boat: "Demopolis Lock, Demopolis Lock, this is pleasure craft Andiamo." Lockmaster: "What's that? Andamo? Adamo?" Boat: (laughs) "Andiamo. It's Italian for 'let's go.'" Lockmaster: (whistles) "Cain't y'all find the words for that in Redneck?" In Demopolis I had stocked up on crawfish tails and the makings for jambalaya. Dinner that night was quite a treat. What's in those yellow wrappers? 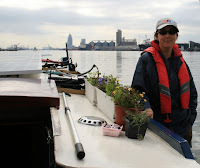 Welcome to "What IS It?, the occasional quiz feature of the SlowBoat blog. Today's challenge involves one of the big barges we've been seeing all along the inland waterways. Our dinghy--an Adirondack wherry--can be rowed faster than the Dragonfly can cruise with its diesel engine cranked to the max. So we always joke that, when we feel the need for speed, we just get out and row. Lately, the conditions have been perfect for rowing. On our trip down the Tenn-Tom, our guide and guru is a slim little book, The Tenn-Tom Nitty-Gritty Cruise Guide, by Fred Myers, an experienced local boater. 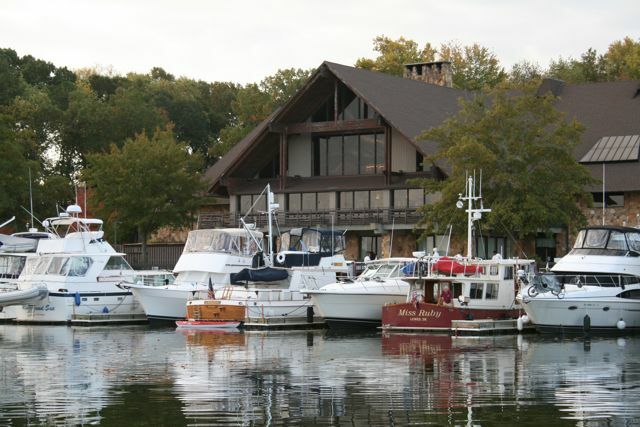 Besides the usual data on marinas, anchorages, locks and dams, the guide alerts you to notable sights along the way. Like the White Cliffs of Epes. The SlowBoat Nov. 3rd What IS It? Quiz asked you to identify some colorful, soda can-shaped floats. 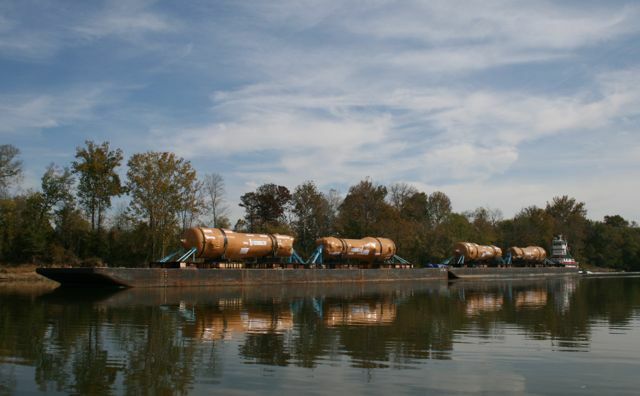 We spotted a whole raft of them blocking our path in the "Divide Cut" section of the Tenn-Tom Waterway. Being egg-headed former biologists, we thought the floats must mark some kind of science experiment or environmental survey. 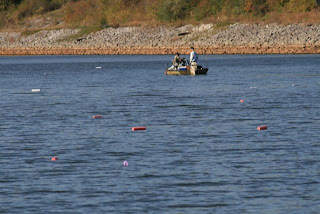 We thought the guys in the boat at left might be state biologists. We hollered over, "What are these floats?" And the guys rolled their eyes and said, "Fishin' noodles." Well, that didn't enlighten us much, but Herb Smith would have nodded in agreement. 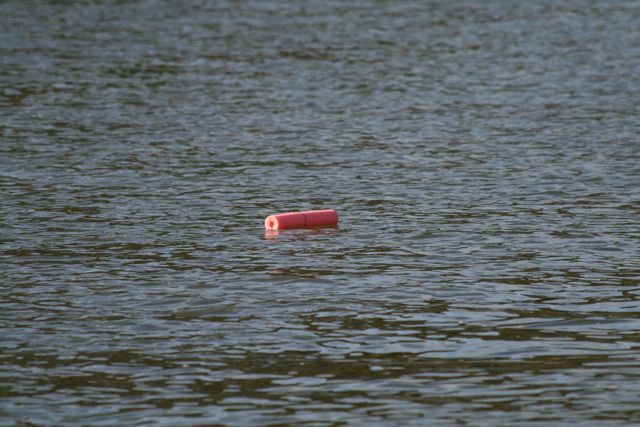 Herb correctly identified the cut-up bits of "swim noodles" as "jug-fishing floats." If you still don't know what they are, you must be a Yankee, and you should check out the "Fishin' noodle" links above to see fishing noodles in action! We started the day about 50 miles north of Demopolis, Alabama. Never heard of that town? Yup, this is a lightly populated area. 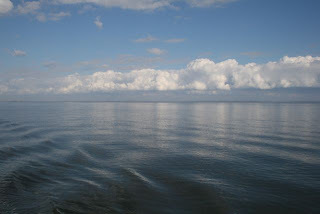 That's why blog posts have been scarce--internet's slower than our boat. To catch a cell phone signal, it helps to stand on the roof. 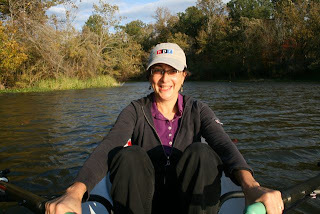 Our trip down the Tenn-Tom takes us through a lock or two each day. The crew is now proficient at lassoing floating bollards. She can flick a loop of rope around that metal post from 6 feet out and haul the end in fast, like a cowhand roping a calf. OK, a slow-moving calf. But still. SlowBoat's official "make and model" is "Lock Master." Each time we pass efficiently through a lock, we high five and intone that Flash Gordon theme song from the band Queen, "LockMaster! ah-ah . . . savior of the universe." When we began our trip, we joked that we were "emissaries for the canal-boating culture." We're on a mission to convert the American public to the delights and glories of canal boat travel. We feel we are starting to see results from our mission. This has to do with the matter of fenders. "Where ARE you?" That's the first thing anyone who calls us on the phone asks. 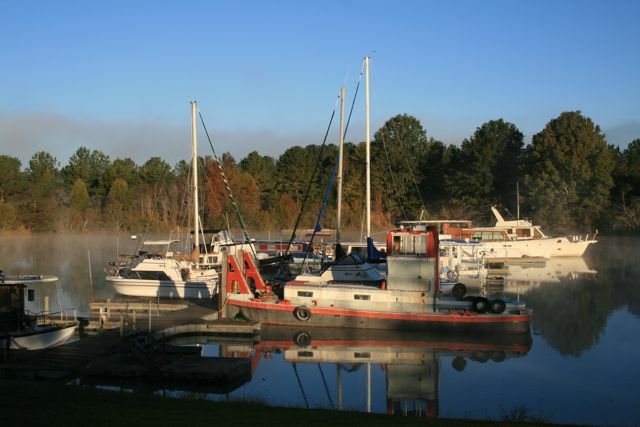 Well, it was cold and misty this morning at Pirate's Cove, the little marina just before the Tom Bevill Lock in Pickensville, Alabama. We docked there yesterday, having spent Saturday night anchored out in the "Hairston Cut-off," a side channel about 12 miles upstream. Where we stayed: Pirate's Cove. Can you find the canal boat in this picture? We stayed for two days at the marina in Columbus, Mississippi. The town does have a Saturday farmer's market. But it shuts down for the season at the end of October. So I bought groceries at a conventional store. Even when I shop at a supermarket, I'm trying, on this trip, to look for "local" products. My theory: Local brands have been transported a shorter distance than national brands, reducing the amount of fossil fuel consumed. Wednesday we cruised past a dock where Scott Paper has a shipping terminal. On the bank was one huge pile of sawdust and another huge pile of bark mulch. 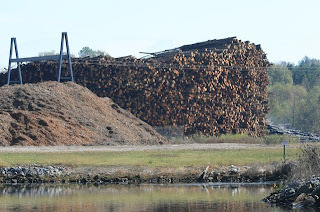 Nearby a crane was stacking tree trunks with as dispatch, ends butted neatly like soda straws in a dispenser. As we cruised towards Columbus, Mississippi, I checked the local paper to see what I could learn about sustainable energy projects here. Apparently I had just missed a local Rotary Club meeting where the speaker proclaimed that "Mississippi is poised to become a national leader in renewable energy production." 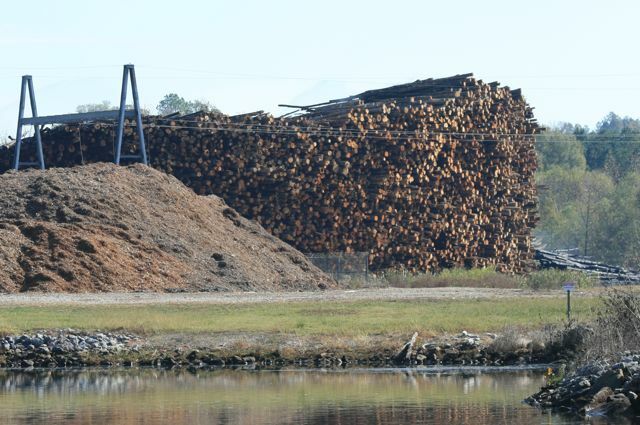 And the reason: The state's abundant timber. 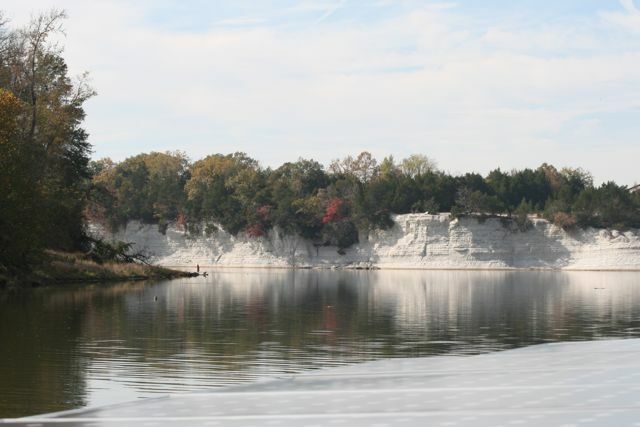 A rock cairn (see photo at left) marks the turn from Pickwick Lake (part of the Tennessee River) on to the Tennessee and Tombigbee Waterway. The Tenn Tom doesn't look like much at first glance. Construction was completed in 1984, and 26 years is not a whole lot of time for nature to reclaim bare earth. So on the initial section, the 27 miles known as the "Divide Cut," it's clear you are traveling a canal. The banks are even and neatly leveled, plastered with rip-rap (small boulders that discourage soil erosion). Industrial-style cement walls border the occasional causeway that admits water from a small tributary creek. 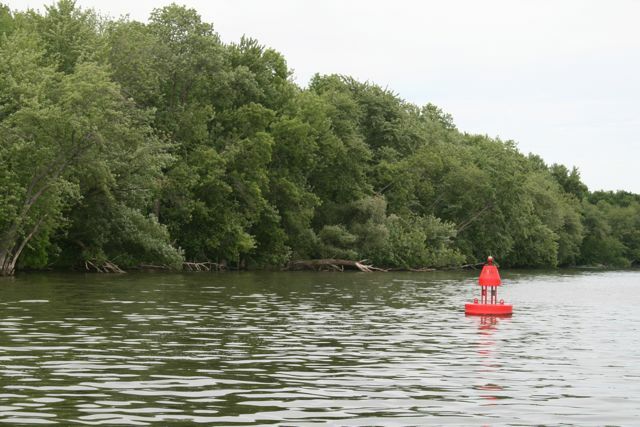 Grass, weeds and some small trees have grown on the sloping banks, softening the impression that you're traveling the water equivalent of an interstate highway. 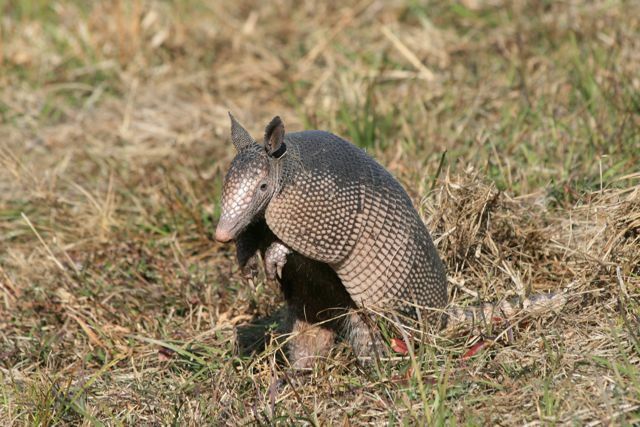 Periodically, this blog invites you to ponder some of the odd and unusual things we spot. 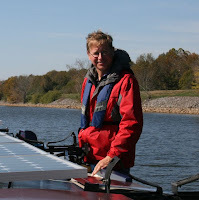 On Sunday we started a new phase of our voyage when we entered the Tennessee and Tombigbee Waterway, a man-made waterway--not old, like most U.S. canals, but opened in the 1980s--that connects the Tennessee and Tombigbee Rivers. 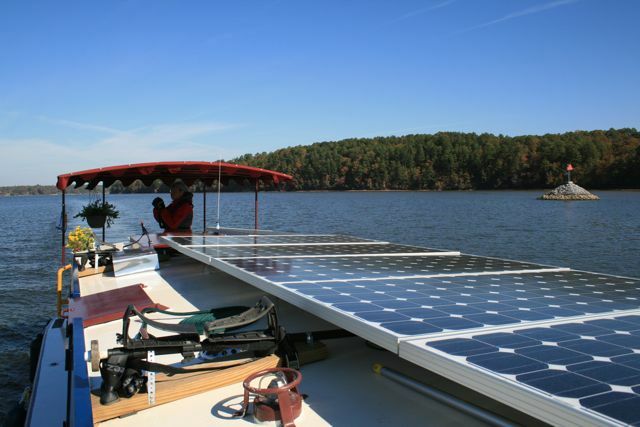 Running due south, the waterway gives commercial and recreational boats an alternative to cruising down the Mississippi River on the way to the Gulf Coast. 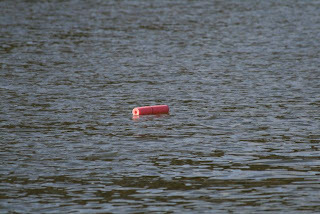 Anyway, coming around a bend this sunny Sunday, we spotted a field of colorful floats, nearly obstructing the channel. Each one was about the size of a Coke can, and each was brightly colored: blue, pink, yellow, Kelly green, lavender. There was no sign to indicate whether it was safe to pass by. Friday night, returning from the Looper Rendezvouz along the Tennessee River, we anchored out (as we had on our way upriver) at the mouth of Dry Creek. 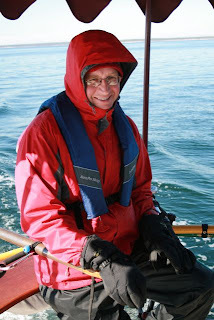 During the night, Bill got up to check the anchor. Our boat was wrapped in a thick blanket of fog. But looking straight up, he could see a clear sky and a thick sprinkling of stars, blazing in a velvet black sky. We say that this trip around the Great Loop is like an "endless summer," as we follow the warm weather south. But lately we can't deny the signs of autumn. During the day it can be warm--up into the 80s. At night, though, the temperature drops to the high 30s. The collision of cold air and (comparatively) warm water makes for pea-soup fog that lingers till mid-morning. 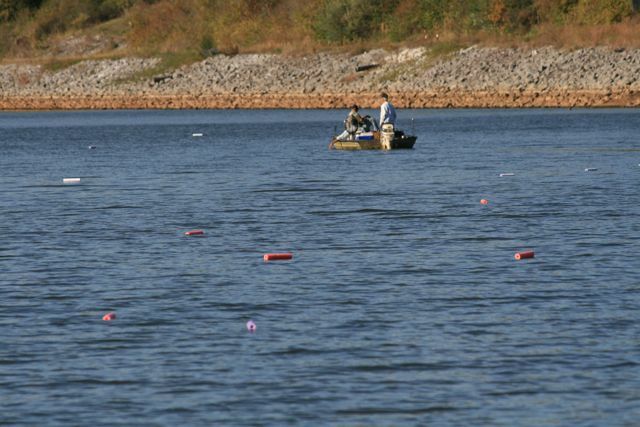 This past week we made a side trip east on the Tennessee River, to attend the annual fall rendezvous of "Great Loop" boaters at Joe Wheeler State Park, near Huntsville, Alabama. 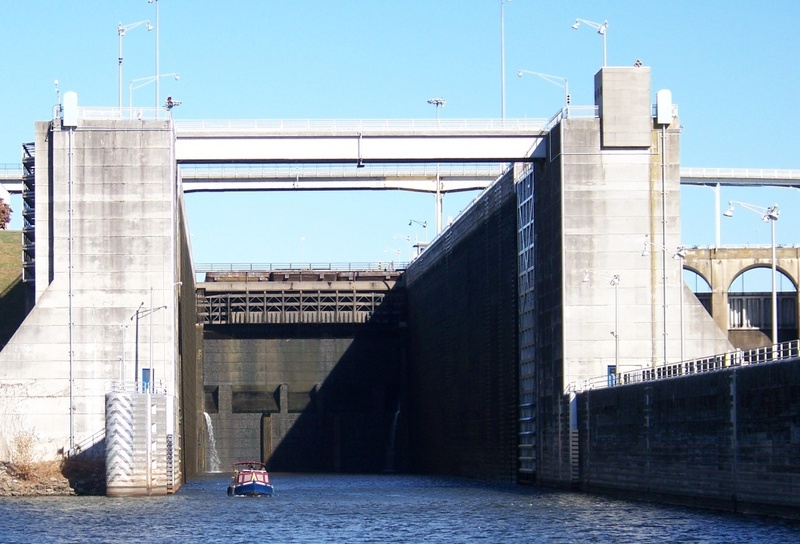 To get there, we had to transit the "Tallest Lift-Lock East of the Rockies."